A head teacher met her untimely demise yesterday after she reportedly suffered a seizure and fell into a drain. 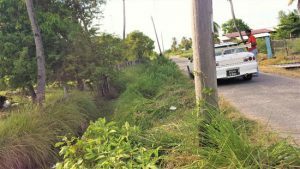 The now dead woman has been identified as 42-year-old Serojanie Singh, a former head teacher of the 8th of May Primary School, Dartmouth, Essequibo Coast. Reports are that some time between 13:30hrs and 14:00hrs yesterday, the woman suffered a seizure and fell into a drain in Dartmouth Community. Kaieteur News was informed that at the time of the incident, the woman was riding back to the 8TH of May Primary, following a visit to a nursery school in the area. Eyewitnesses claim that during the seizure, the woman fell from the cycle, and landed head first into the narrow drain, just off the street shoulder. It was also related to this publication that some residents were warned not to interfere with the body, which was lying face down in the muddy water. The mother of two was reportedly pulled from the trench, gasping for breath, and was rushed to the Charity Oscar Joseph Hospital where she eventually succumbed. Kaieteur News was later informed that Singh was appointed head teacher of the 8th of May Primary just months ago, after serving in the teaching profession for some 25 years. The woman reportedly shared her Bounty Hall home with her daughter, who is no devastated upon learning about the incident. Neighbours on the other hand said that they will always remember Singh as a friendly, yet strict and straightforward neighbour.